Taj Mahal is one of the most beautiful architectural masterpieces of art in the world. Declared a monument of world heritage of UNESCO, the palace is set in the texts of the organization as the jewel of Muslim art in India. 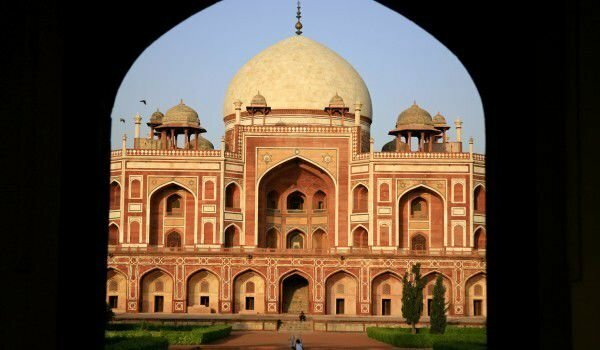 It is located near the southwestern shore of the Yamuna River, about 200 km in the south of the capital, Delhi. The exquisite architectural monument is located in the state of Agra. It was built by Emperor Shah Jahan for his favorite wife Mumtaz Mahal as proof of his immense love. The Memorial Palace is famous precisely for this reason as the temple of eternal love. The origin of the name Taj Mahal is not clear, as the architect of the building is not clear. Mumtaz and Shah Jehan were married in 1612 A.D and had 14 children. The Empress Mumtaz used to accompany her husband in his military campaigns and in Burhanpur in 1630, that she gave birth to her last child, after which she died. The Shah Jahan loved loved his wife Mumtaz so much, that he ordered the building of the most beautiful mausoleum on Earth - The Taj Mahal. After his wife’s death, Shah Jahan reportedly locked himself in his rooms and refused food for eight days. According to legend, when the emperor emerged from his seclusion, his black beard - visible in many Mughal miniature paintings - had turned completely white. For such a conjugate is often the name of Persian origin Anand of Ustad Ahmad Lahore. The actual construction of the Taj Mahal began in 1630 and was completed 22 years later. 20 000 people were hired to work in the construction. It is possible that the work was coordinated by an Italian artist. For the construction of the exquisite memories are selected and summoned only to masters, artisans, sculptures and Calligraphy artists throughout Europe, Persia and the Ottoman Empire. 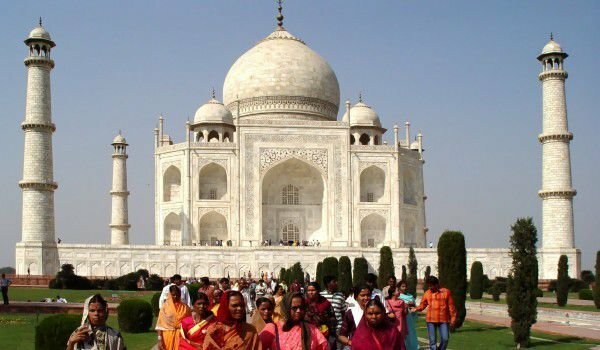 The most expensive white marble was brought to Agra. The Taj Mahal has 16 chambers, 8 on each two level, that surround the octagonal funerary chamber surmounted by a surbased inner dome. In the funerary chamber are found the cenotaphs of Mumtaz Mahal and Shah Jahan, enclosed in a baluster of delicately perforated marble and studded with semiprecious stones. Particularly impressive here are the marble floor of black and white squares, 40 meter minarets on the corners of the pedestal of the palace and the extent of its central dome. The facade of the Taj Mahal is distinguished by painted arches at the entrances and of the Quran words which appear the same size from all angles. External structures are made in the Pietro technique which includes the elements of flowers, plants and geometric figures. As a tribute to a beautiful woman and as a monument for ever lasting love, the Taj Mahal reveals its subtleties when one visits it without being in a hurry. The rectangular base of Taj Mahal is in itself symbolic of the different sides from which to view a beautiful woman. The main gate is like a veil to a woman's face which should be lifted delicately, gently and without haste on the wedding night. 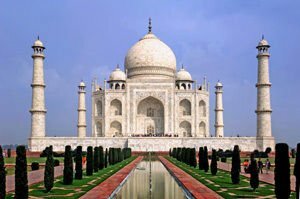 For people in the world the Taj Mahal is the mausoleum of Mumtaz Mahal the wife of Emperor Shah Jahan symbolizes the very India. Its curved and beautifully constructed dome and large square bases around them are known to pictures of hundreds of tourist brochures and postcards. Glorified with majestic architecture and grace, the Taj Mahal is attributed to the proud achievements of mankind and the divine is that it is part of the list of the greatest wonders of the world. Visitors to the Taj Mahal will discover the ingenious, harmonious perspective of the gardens and canals which towers the massive form of the mausoleum. At the intersection of the canals, the shimmering waters of a wide ornamental pool reflect the vaporous silhouette of the Taj Mahal and the outline of the tall, elegant cypress trees, underlining the subtle symmetry of the whole.